Meet the Robinson family this 13 April! Just hearing the words "Lost in Space" is sure to bring back some memories. That's because you've probably seen a rerun of the 60's television series or perhaps the 1998 movie version, the latter which starred Matt LeBlanc and Gary Oldman among others. Now Netflix is breathing life into their own take. We meet the all new Robinson family in the year 2046, whose plans to be a pioneering family for space colonisation in Jupiter get derailed as they find their spaceship stranded on an unknown planet. Although the TV series and the movie before this was mostly a light-hearted watch, this reimagined darker version is said to be filled with mysteries and will be the next best thing for fans of "Stranger Things" and "Lost". The Robinson family themselves features a diverse cast of definite talents and the patriarch, John Robinson, is played by Toby Stephens from TV's "Black Sails" and yes, he's also the dude who played the James Bond villain in 2002’s "Die Another Day"! The matriarch, Maureen Robinson is played by the brilliant Molly Parker, who you've seen on "House of Cards" and "Deadwood". 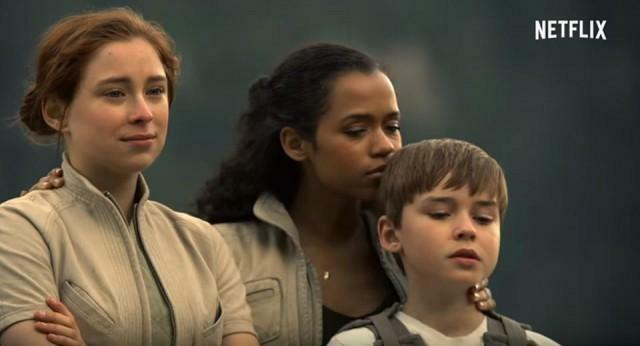 The kids are played by Taylor Russell (the eldest child, Judy Robinson), Mina Sundwall (middle child, Penny Robinson) and Maxwell Jenkins (the youngest child, Will Robinson), the latter who will surely steal your hearts with his adorable presence! The kids of “Lost in Space”. (L-R) Mina Sundvall, Taylor Russell and Will Robinson. The show promises to be a mix of sci-fi and family drama, but most importantly, it wants you to care about the characters and that's probably what will keep one hooked to the series from the very start. Oh, and there's a pretty cool robot and a sinister antagonist that will just be a joy to watch! 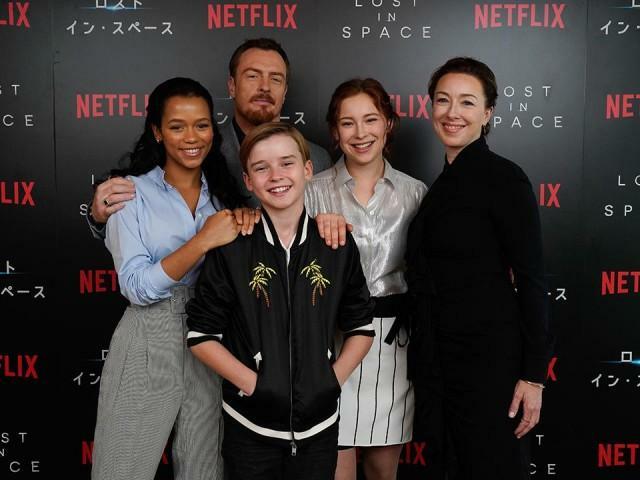 Don't take our word for it, let's hear what the Robinson family themselves have got to say about "Lost In Space" that will release all 10 episodes this 13 April 2018 on Netflix! Now, that's one cool robot! We love the way the family is depicted in "Lost In Space". What do you think sets it apart from the big screen version and also the TV series? Molly Parker: Audiences are so sophisticated now that this show needed to have a massive scope and a great scale of adventure, while still carrying the spirit of the original. It was about a family in an extraordinary circumstance, and it is still what the show is about now. Mina Sundwall: We modernised both the script and the social setting. And we have strong female characters who are very independent and dedicated. Maxwell Jenkins: Our family is not just a family on space. It's a global mission to save humankind. Another difference is that in our show, like Mina said, is that we have female characters of power, which I feel is about time! Was the chemistry instantaneous for you guys as a family? Maxwell: We couldn't stand each other for a second. Molly: We're really lucky because sometimes you work with kids and it’s very difficult. Maybe because the kids don't really want to be there, or it is just the parents who want them to be there. There are all kinds of things that can happen, but we have a young cast that are such extraordinary people and they come from such wonderful families. They're not Hollywood kids. Toby Stephens: I've had experiences. Not many thankfully, but some experience where kids have been cast because they look right, but they can't act! It's really difficult when you're stuck with someone and the director is trying to elicit a performance from a child and there is just no way that will happen. These kids in "Lost in Space" are just naturally talented and really good at what they do and it's such a privilege to work with them. What is the Robinson family creed or motto? Toby: I think we will probably find the creed as it goes on. When we start off, we're still trying to find who we are and what we believe in and why we're in the situation we're in. Molly: Yeah, I think that's really a big part of this story where this family is somewhat fractured and is able to find its way back together. Max: I'm not! Well, the Robinson family by the end of the series... their creed is family and they always go back to being a family. Like Molly said, yes, it's a fractured family, but no matter what, the Robinsons stick together. What do you admire about your roles? Taylor Russell: Determined, book-smart, and a person who takes a lot of responsibility in the family. It's really important to her and also wanting to be an integral part of the family. Mina: I like the fact that my character doesn't hide behind a mask and is always completely who she is upfront. That might not fit into every situation, but she is so genuine and I find that admirable. Having had her in my head like a roommate for a year, I am learning to be like that myself! Max: First thing, Mina and Taylor... you are your characters. That's the best thing ever. What I liked about Will Robinson was that a lot of 11-year-olds and probably adults can relate to what he felt at the beginning and towards the end. I liked that people can relate to being scared and lost, not just in space, but being lost as a person. Currently there are many new space or sci-fi shows out there, so what is the unique point of "Lost In Space" and what sets it apart from the rest? Molly: This show combines real characters and complicated family dynamics in an extraordinary circumstance. It's not just science fiction and it is not just a family drama. You will care about these people and also feel really entertained. Mina: It is set in space and there is that sci-fi element that is so prevalent in this story, but each individual character has their struggles for their good-side and their bad-side. That will be something that people will be able to connect to. Toby: It's not one of those Space Operas like "Star Wars" where you have things blowing up and people talking. Forgive me, but you don't really need to go to that to relate to it. It's not like you would go, "Oh yeah, I totally in this situation too and I can relate to Luke Skywalker". [Laughs] It's also not one of those dystopian things like "Blade Runner" which is very dark. This is its own thing. It's a domestic situation, so it's relatable to almost everyone. Toby, you've come from a pirate ship in "Black Sails" to a space ship in "Lost In Space". What parts have you brought forward from your past show to this show? Toby: [Laughs] Well, sometimes, yeah. Actually, it was a breeze to shoot "Lost In Space" compared to "Black Sails". It was from playing a really dark character to this character who has a lot of aspirations, and in general, people trying to be better people. It's such a positive thing. There are times when you feel that the world is becoming a very dark place, and that includes what you watch on TV as well. It's great to have done this show and I hope that people will feel so much of relief at it being something they can actually enjoy with their family and a show that makes them feel good at the end of the day. EXTRA: Watch what happens when four Malaysians are recruited for a mission to save the Robinson family!